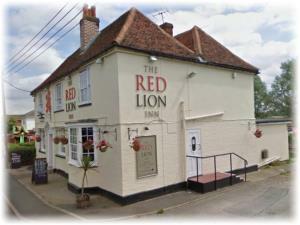 The Red Lion Inn01621 740298work InnLatchingdon is a small pleasant village set in the Dengie Peninsula not far from Chelmsford the County Town of Essex. For at least 169 years, the Red Lion Inn has been offering a warm welcome to travellers, visitors and locals alike. In the summer, we have a large garden to relax in where the children are more than welcome. There is a large play area for them of which on most sunny days also includes a bouncy castle, and there is seating for around 100 people so you should be able to sit down, soak up the sun and enjoy a cold drink! Nearly every other Friday there is live music or karaoke nights (look at the events page to see what’s coming up) which tends to draw in large crowds and makes it a good atmosphere to be in. Our wide ranging menu will satisfy the hungriest visitor and our well appointed accommodation is available for those looking for a pleasant night away, be it for leisure or business. Latchingdon is a small pleasant village set in the Dengie Peninsula not far from Chelmsford the County Town of Essex. For at least 169 years, the Red Lion Inn has been offering a warm welcome to travellers, visitors and locals alike.